Place apples in glass pie pan or baking dish. Spoon mixture into holes in apples. Place apples on glass serving dish. Pour liquid caramel over apples. 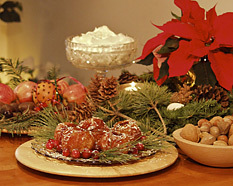 Decorate plate with pine branches or holly and fresh hard cranberries. Sprinkle lightly with rum or brandy. Not only are these delicious and beautiful, they will make your house smell like the holidays. Use glass baking and serving dishes as the caramel will be easier to clean later. Use warm running water to clean.